What the store operator sees, the customer sees. 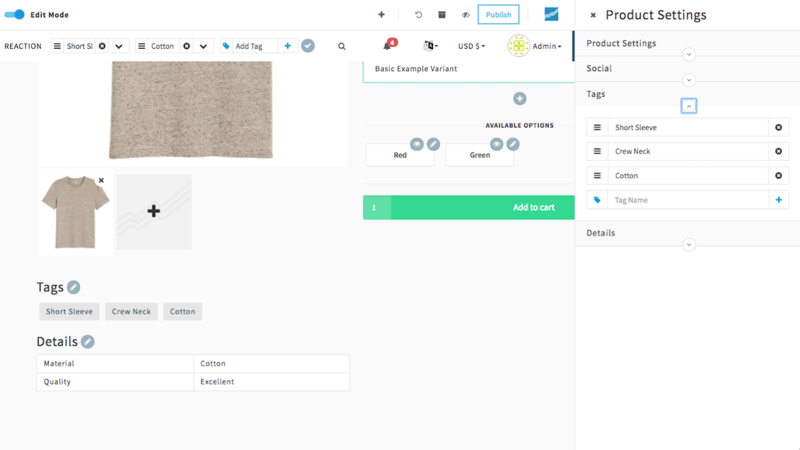 Create, edit, preview and publish products inline, right on the Product Detail Page (PDP) itself. At any time in Reaction's Product Detail Page and Product Grid pages, click on Edit Mode at the top to toggle between the customer view and admin view. Click on the plus , located on the top right. If you're not already in Edit Mode, clicking on the plus will put you in Edit Mode. Now you will be in a Product Detail Page's Edit Mode, add product title, subtitle, vendor name, and description by clicking on each section and typing into the field. After typing and editing a field, a golden pencil status indicator appears to show that there are unpublished changes that need to be published. To upload a product photo, click on the plus on the photo placeholder. You can upload multiple photos at a time by selecting more than one. You can also drag and drop multiple photos into the box. 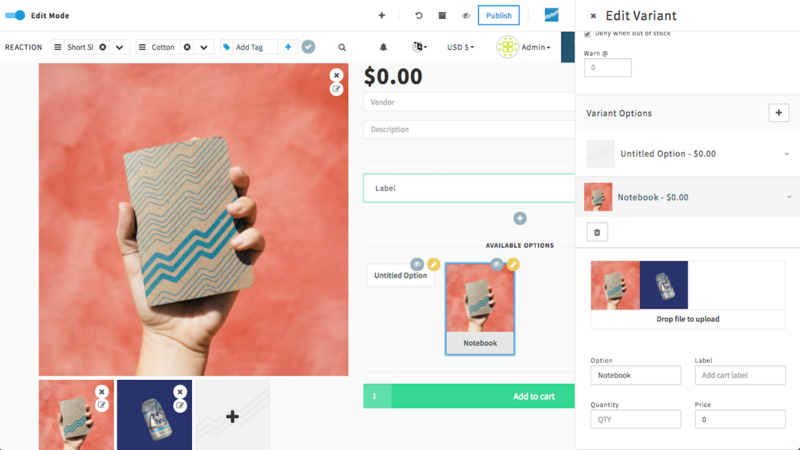 Editing social media sharing and tags from the sidebar: If your shop is connected to social media sharing, customize your product's social sharing messaging by clicking on the icon on the right of the product pricing. Add product tags by clicking on the plus , located under the Tags card. 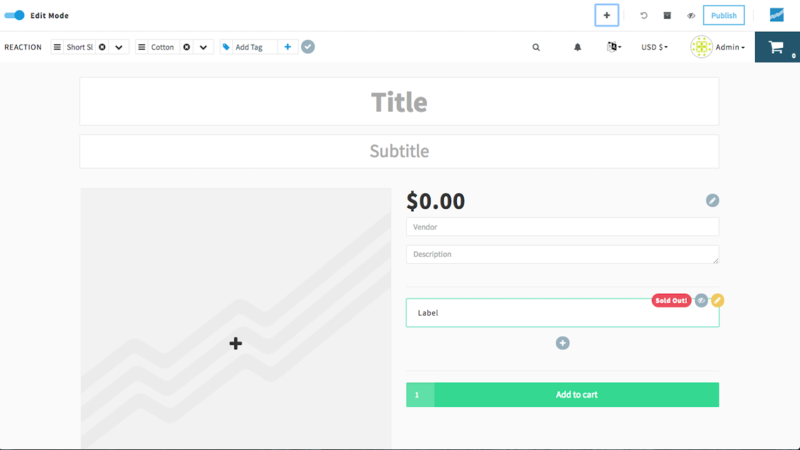 You can change the layout template, product title permalink, subtitle, vendor, description and origin country from the sidebar's top Product Settings option. Click the Publish button on the top right to save Unpublished changes, indicated by the golden pencil i class="font-icon fa fa-pencil"> status indicators. Product Variants allow you to create different versions of the same base product. Perfect for products that come, for example, in multiple colors. Click the icon, located under the Options card. Label - Required. A description of your variant, which appears in the under the Options label on the Product Detail Page. Origin country - Optional. A drop-down menu of countries. Weight - Optional. The weight of your item, which will help determine shipping costs. MSRP (Manufacturer's suggested retail price) - Optional. The suggested retail price of your product. Price - Required. The price that you are actually selling your product. Taxable - Optional. Check this box to automatically add tax to this item when purchased. Add Tax Code and Tax Description for more options. Inventory tracking - Optional. Check this box if you'd like to track this item in your inventory. Warn at - Optional. Adds the Limited Supply badge on the Product Grid when quantity is lower than this number. Allow Backorder - Optional. Allows customers to backorder the product. Click the Publish button on the top right to save Unpublished changes. Variant Options provide a second layer of customization on top of each variant. For instance, in addition to carrying shirts in multiple colors, you may also want to carry multiple size options for each color. Use this flexible structure to customize your products however you like. Click on the button to the right of the Variant Options section. Add the Variant Option's Label, Short Label, Quantity and Price. Label is displayed in cart, checkout and orders. Short Label is displayed on the Product Detail Page. All fields are required. Keep adding more options by clicking the button. 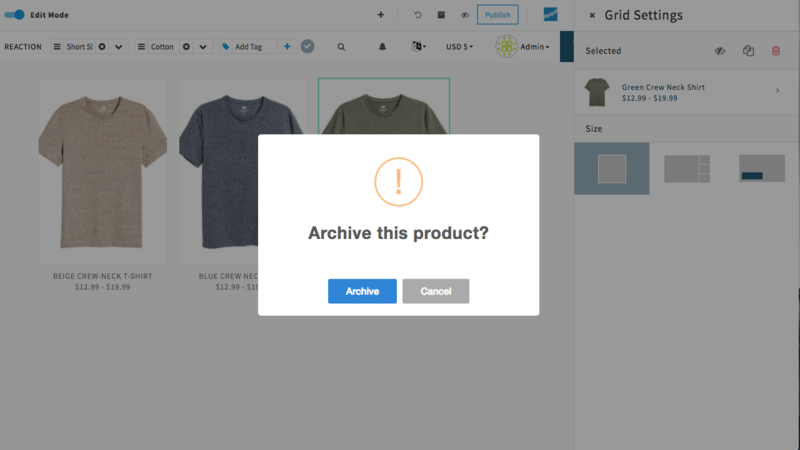 To add an image gallery to your product, drag and drop files from your computer the main Product page. You may also upload images using the "Drop file to upload” button under each Variant Option. Currently, only image file types are supported, but support for video, Google Drive, Dropbox, and more are in the works. See Issue #50 and Issue #69. Once you have images added to your gallery, drag and drop to change their position. Click on the next to the product price. Click Tags to add, remove or rearrange product tags. Tags are links displayed below the images section. Clicking on a tag link leads the customer to a page listing all of the products with that tag. Tags can be linked to the top navigation bar. Click Details to add or remove product details. Details are displayed under the Tags section as static text in a table. Reaction supports discount codes and rates. Read more about discounting products in the Dashboard's Payment section. Click on the Archive button .